**The condo next door is being remodeled between March 11 to September 15. Prices reflect the inconvenience. Contractors may work at Puu Poa between 8 am until 5 pm Monday through Friday and Saturday 9am to 5pm. No work will be done on Memorial Day, King Kamehameha Day, Independence Day and Labor Day. **Free mid-size car while cars are available. Not valid with any other special offers. The car can be upgraded for a minimal fee, unlimited mileage and taxes included and is picked up and dropped off at the airport. Cars are on a 24-hour basis so if flight arrival and departure times exceed the number of days reserved, there will be an additional charge. It’s easy to find your bliss at this newly remodeled, ground-floor oceanfront escape (two flights of stairs down to get to the front door). With new designer furnishings, panoramic ocean views, and convenient amenities throughout, you’ll feel completely at home while living the good life on Kauai’s North Shore. Kick back and enjoy quality vacation time together in a spacious, open living room, where a flat-screen TV with a DVD player makes movie nights a must, and the iPod dock and CD player helps create breezy island vibes to go with the stunning ocean view. Keep a lookout for whales with the telescope provided! With a grocery store at Princeville Shopping Center less than a five-minute drive away, you can enjoy gourmet meals at home in the open chef’s kitchen with stainless steel appliances, granite countertops, and an eat-in bar. Dig in at the formal dining table for six, alfresco on the lanai, or picnic-style on the lush lawn just steps from the back door. Two beautiful bedrooms sleep four in ultimate comfort, with a queen-size bed in the guest room and king-size master suite off the living room. Two full baths make sharing space easy, including a luxurious master en-suite with a Japanese soaking tub and open shower room for ultimate pampering. *Please Note: Hideaway Beach is accessed by a five-minute hike down the private trail and can be difficult for those with mobility issues. Puu Poa Beach access is across the street down a long stair path, so it’s best to pack light! An Explorer’s Dream: Experience the North Shore by foot on the two-mile walking path just outside your front door, or take a road trip with the free midsize car rental when you stay seven or more nights. Puu Poa Perks: Bask in the heated pool overlooking the ocean, unwind in the hot tub, challenge friends to a tennis game, grill up lunch at the communal BBQs, and enjoy private access down to Hideaway Beach for some of the best summertime snorkeling around. Room to Relax: With over 2,000 sq. ft. of breezy living space, a gorgeous open kitchen, and a private bath for each bedroom, it’s easy to come together or retreat for peace and privacy whenever you wish. With five-star St. Regis Hotel right next door, you’ll be just a three-minute walk from a world-class spa and award-winning restaurants. World-famous Hanalei Bay is just a short 15-minute drive, or soak up Kauai’s dramatic beauty from nearby Makai Golf Club, on a horseback ride along the beach, or a waterfall hike along Kalihiwai Falls. You won't be short on choices! Gigi texted us a welcome shout out upon arrival. I used her as the point of contact for a few minor issues such as a light bulb being out in the stairwell, the iron not working, the bath tub drain was clogged. She immediately reached out to the property managers for us (even on the weekend when the office was closed). She was always friendly, helpful and available over text and and made me feel I was not a bother, no matter what time. The booking team (Kahea and Janie) were also great and would get back to me quickly with answers over email. I did not once have to call because of their expertise and efficiency over email. They both kept me informed and always updated me on everything whether it was the car reservation or late check out. I was treated as if I was their one and only client. Thank you all for making this a smooth and painless booking experience which added to the best family vacation ever. Everyone was professional and we appreciate you all. --- Mahalo, Jeri!! Your thoughtful review is very much appreciated! We had an issue with the tennis/pool key not working and we met the property manager Eric outside who switched out the key for us. Apparently, it was an old key. The stay was discounted because of the next door demolition. I, at first was concerned our stay would be noisy but figured we would be gone most of the day. As it turns out, we did not hear or see one peep of remodeling. In fact, the entire property was quiet although full. Residents are very respectful and concientious of noise. We would stay here again for that reason and the fact that the residence alone was gorgeous and fully stocked wth everything needed for an enjoyable beach stay. --- Mahalo, Jeri!! Awesome! We're happy you had such a great time on Kauai and we definitely look forward to working with you, again! Aloha! Linda is the best person EVER to work with. She made our vacation perfect. --- Mahalo, Gwen! She would certainly be happy to read this comment!! Beautiful condo with an amazing view and very comfortable accommodations. The kitchen is really nice to cook in and is equipped with everything you need (really great sharpe knives). We would defiantly stay here again. --- Mahalo, Gwen! We look forward to your return!! Guest review taken from Airbnb on 4/10/19 for Puu Poa 105 --- Wonderful stay at Puu Poa 105! Loved the location. Condo was EXACTLY as pictured so no surprises. We thought not having A/C would be an issue, but being by the water, there is always a nice breeze and the evenings are very comfortable. It is a bit pricey but we did get a discount because of the construction going on nearby so for us it was totally worth it. Would definitely book again if and when we come back! Easy to work with . I had a question about the rental car and it was handled fast and efficiently. Absolutely loved this property! It was clean, well equipped and in a great great location. We arranged for a late checkout and happy we were able to get extra time on our last day on the island. I would certainly recommend this property to friends. We liked having a rental car included in our reservation. MANAGER RESPONSE: Mahalo! Hands down the BEST place to stay on Kauai. Easy access to secluded beaches (Hideaway and Secret) and to local amenities. Easy drive into Hanalei, and incredible views of every sunrise and sunset. You will NOT want to leave this place. We would totally recommend Great Vacation Retreats to everyone as a rental resource. The staff was on top of our every need and went out of their way to help us, when we had issues which were mostly our own. Like locking ourselves out of the unit. I have never had staff that was so attentive that they answered our text within minutes and follow thru to make sure our every need was met. From the beginning of making the reservations to the end, we would Highly recommend GVR! MANAGER RESPONSE: Awe, thanks so much for your review! We really appreciate it. Thanks for being great guests! Puu Poa unit 5 Pros: Beautiful renovated unit!! Everything in the condo was great including the way it was furnished. It is a great location, right next to St Regis, so you have access to the beautiful beach and restaurants. Cons: It is a condo unit. We had issues with hearing other owners complaining. Not just a little but a lot. When we were at the pool trying to relax, a few of the owners of other units where sitting around complaining about the HOA. Not what we wanted to listen to on vacation. The next day the door neighbor stood out in front of our unit windows on the Ocean side while we were in the unit for at least 40 minutes talking very loud to someone (possible a contractor) about what needs to be done to the buildings and then she did the same thing right outside the front door for another hour complaining to someone. It was totally annoying. Lots of grumpy people living in these units. I personally would not stay at Puu Poa again! MANAGER RESPONSE: We are working with the owners regarding your comment of the other condo owners. Apparently there is a problem with a current item on the vote for the association. This is no way is your problem nor should you have to listen to it on vacation. Unfortunately, being that this is a condo complex, we are obviously unable to control the actions of others. We were able to verify that it was not the neighbor making complaints but a visiting member of the board. I don't think it will be an issue again. Thanks for letting us know! Any questions I had was answered immediately. a wonderful gift basket for my birthday and anniversary was waiting for us! It was so wonderful and I am so thankful! The property had amazing views of the ocean and sunset! Pool was inviting! No AC, but that didn't bother us. The sliding doors were perfect for getting in fresh air and plenty of fans were available for night time. I hope to come back and hope I can stay in the condo again! MANAGER'S RESPONSE: We couldn't just not acknowledge your birthday and anniversary while you were on Kauai. So glad that you enjoyed our little gift basket. Hope to see you again soon! Great location. Love the access to Hanalei and Hide-a-way beach. The complex was quiet and very scenic overlooking the beach. Beautiful space with lots of room and comfort. The view is amazing and the access is easy, as long as you don't require a cane or have mobility challenges. The host was very connected with us throughout our stay, making us feel very secure and cared for. We had a great stay. The accommodation is wonderful and was accuretely portrayed on the site. Super easy dealing with the team. Many thanks! 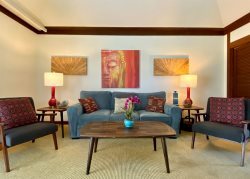 This condo is a great place to stay in Kauai! It is HUGE - way larger than we expected from pictures. The condo had an amazing ocean view and a whole wall of windows to enjoy it. Lots of comfortable seating areas. The kitchen is large and has all the things you need to cook some meals. The host was easy to communicate with and their is a great binder of recommendations in the unit. Not to mention the free rental car! So great! we had trouble with a car battery and Brian (Bryan?) was a prince in helping us get sorted out. Wonderfully friendly, super helpful. Beyond expectations - the condo was beautiful, well-appointed, (all those towels! ), quiet, and absolutely lovely. Gorgeous, relaxing space. Quite expensive yet worth every penny. Thank you. Check-in was easy, the space was great, and the decor matched Kauai's northern coast. Definitely recommend this space for anyone looking to relax and catch a few rays.